The Polar RS800CX heart rate monitor is an advanced heart rate monitor with features specifically designed for serious endurance athletes and competitive runners. Important Note: The newer Polar RS800CX heart rate monitor is based on the Polar RS800 and adds the following functionalities: support for Polar Speed Sensor W.I.N.D. 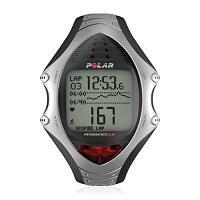 and Polar Cadence Sensor W.I.N.D. for cyclists, and support for tracking when used in conjuction with the G3 GPS Sensor. Measurement of changes in altitude while you are running. The wrist watch shows you how many meters you have ascended or descended and your current altitude. Polar Fitness Test: You do the test and you get a score called OwnIndex (comparable to VO2 Max) measuring your cardiovascular fitness. You also get your Predicted Maximum Heart Rate which is expected to be more accurate than the age based formula (220 - age). Polar OwnOptimizer Test: You do this simple test and the result tells you if you have been over- or under-training. You can do 5 types of exercise: Free, Basic, Interval, OwnZone and Custom. There are 3 ways to use heart rate zone(s) in training: You can set the limits manually. You can use OwnZone in which case the RS800CX does a test on your fitness to decide the zone limits before your exercise. Finally you can use Polar Sport Zones. There are five Polar Sport Zones. You can specify (up to) three heart rate zones to use in a single training session. You can set timers for the zones to come up with your own training plan. You can exercise without a pre-set heart rate training zone. However, while exercising, if you change your mind and want to exercise around your current heart rate, you can use ZoneLock to lock in a heart rate zone around your current heart rate. Store lap and split time. Lap time is elapsed time for one lap. Split time is total elapsed time from the start. You can store up to 99 laps in total. You can also see your average heart rate in a given lap. You get to review total number of laps, average time per lap, best lap time and number. For each lap, you see the lap number, split time, lap time, average heart rate, maximum heart rate, heart rate at end of the lap. You can review the last 99 Files (exercise sessions). Reminders: Set this to remind you to do something (or to train) on a regular basis. Up to 7 reminders can be set. Event Countdown: Set this to remind you of an upcoming race. Polar WebLink to transfer data between the heart rate monitor and your computer. Requires an IrDA port on the computer. Otherwise you won't be able to download or upload data from/to the computer. Digital wireless transmission with its WearLink W.I.N.D. transmitter. W.I.N.D. technology eliminates interference from external influences. The chest strap is made of soft textile material. You can replace the WearLink chest strap's and the wrist watch's batteries yourself without sending it back to Polar. It supports Polar S3 Stride Sensor (optional) for speed, distance and cadence information. It supports Polar G3 GPS Sensor (optional) for speed and distance information using GPS technology. It supports the viewing of GPS tracking data after data is downloaded to the computer. For cyclists, it supports Polar W.I.N.D. Speed Sensor (optional) and Polar W.I.N.D. Cadence Sensor (optional). And many more minor settings and features too numerous to mention here! The features highlighted in bold in the list above are found in Polar RS800CX heart rate monitor but not in Polar RS400. For more information about the shared features between RS800CX and RS400, please refer to the Polar RS400 page. As with the RS400, the most significant feature of the Polar RS800CX heart rate monitor is the Polar ProTrainer 5 software that comes with it. The Polar RS800CX heart rate monitor now uses digital wireless transmission to guard against unwanted interference and the chest strap is now made all the more comfortable to wear. It also measures changes in altitude. Later on when you download the data back to your computer, you can for example see how your heart rate changed as you ran up or came down a hill. Heart rate variability is basically fluctuations in heart beat intervals. Monitoring changes in it while you are training can help you detect a change in your training load and stress. Polar ProTrainer 5 software: The Polar RS800CX heart rate monitor comes with the Polar ProTrainer 5 software which you install on your own computer. Instead of having to upload your training data to a web site (as in RS200), you upload it to your own computer for detailed analysis. You can also use the software to plan your training program (e.g. complicated interval training), and then download the program back to the heart rate monitor. There are many things you can do with this powerful software. The Polar RS800CX heart rate monitor (suggested retail price: $389.95) is the most advanced heart rate monitor in the RS series. Almost anything you can think of that you need for your running training is there. It is meant for highly competitive runners. Beginners will most likely be overwhelmed by the features on this running computer. If you want speed, distance and cadence measurement capabilities, choose the Polar RS800CX RUN heart rate monitor. This is effectively the Polar RS800CX heart rate monitor plus the Polar S3 Stride Sensor W.I.N.D. You can upgrade from the Polar RS800CX to the Polar RS800CX RUN by buying the S3 Stride Sensor. Alternatively there is the Polar RS800CX MULTI heart rate monitor which comes with the Polar G3 GPS Sensor included, providing speed and distance measurments and tracking functionality.